In my last blog post I proposed that the “involvement of art, interactive-critical thinking and processing seem[s] a key interpretive element for larger topics of access, understanding and analyzing the purpose and effect of genetic engineering experiments. I avidly believe it is. 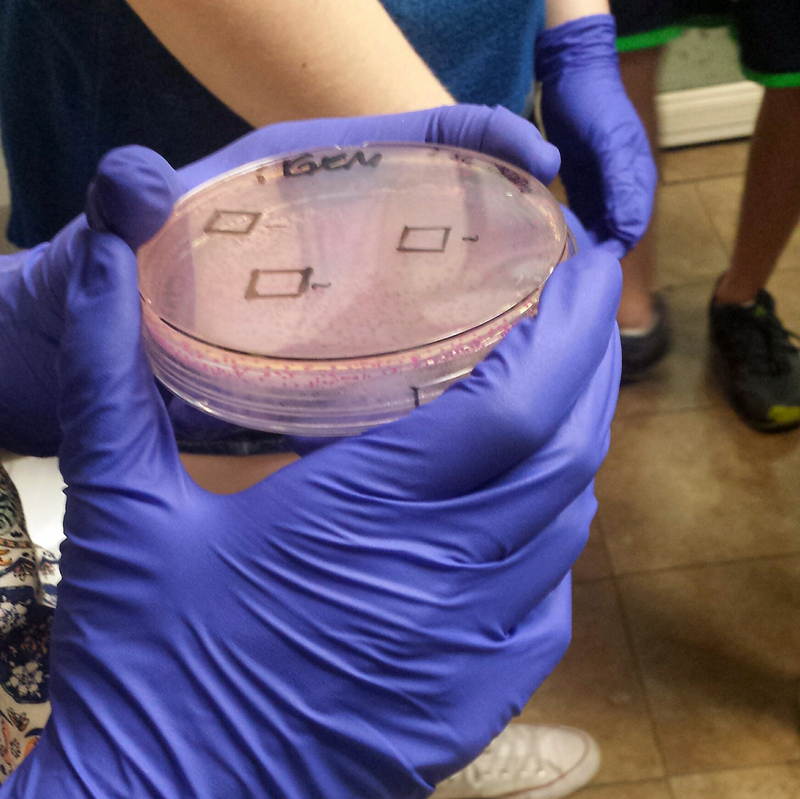 Up until two weeks ago, high school students that are taking part in the Genspace iGEM team had been coming to the lab to do serial dilution tests (test the survivability of e.coli after different time increments of dehydration followed by resuspension and plating onto agar- essentially, rehydrating e.coli samples to see how well they grow after different amounts of time being dehydrated as a basis of comparison to be executed with tardigrades-testing this water dwelling, eight legged micro animal’s ability to survive under dehydration conditions due to certain genes. Identifying and isolating these genes for potential use in the production of vaccines- allowing vaccines to retain effectiveness in the presence of heat when traveling to high temperature countries lacking access to certain vaccines is an ultimate goal of this project). They have also been isolating tardigrades (essentially extracting them from the water and moss they live in) and considering utilization of the CRISPR technique with the tardigrades. Twice a week and beginning two weeks ago, everyday, the high school students come to work on this project during which I participate and observe. 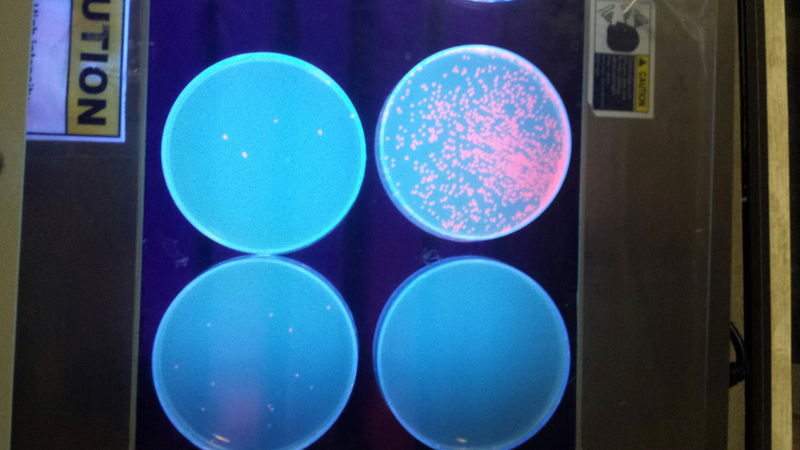 Participate to understand protocol processes, teaching methods + mediums for teaching, how students are learning and perhaps integrate another viewpoint- ex: commenting on changes in transparency of agar interacting with bacterial colony growth which results in light (when the petri dish is held up to be seen more clearly) highlighting certain “focal” points of this circular, 9 ” radial composition. Common responses to these comments I make include but are not limited to: smiles of acknowledgement for the comment (I find these a bit funny and endearing), comments like “oh yeah! cool!” and “huhs” followed by what I have hoped to be looks of pondering, pondering alternate methods of viewing physical aspects of results/protocol steps. I muse about ideas and reactions to my visual interpretations within the lab context of collecting quantitative data for a “what does this mean and how will it have subsequent effects in the minute steps that add up to addressing a broader exploration/topic” versus a “what is this now and how can it be understood outside its current context” mindset. How can alternate forms of interpretation such as poetry, process and visual similarities with patterns in literature, bee flight paths, people’s tracked habits, etc. patterns allow one step in an experiment, one petri dish, be appreciated and understood outside of the exclusively quantitative? However, that being said, one could argue the opposite- that all patterns are only able to become recognized as patterns due to their calculable, repetitive nature which allows us to quantify the image, action, anything; thus patterns fundamentally are the summarization of quantification? and can identified repetition ever be completely fixed? A habit, predicted flight behavior of bees, predicted and actual growth rate (number of colonies predicted for growth) and cell behavior with the uptake of certain plasmids, etc. exist as predictable as a pattern due to quantification but within a statistical range. I’ve come to better understand and believe in the idea of maximum 99.99% accuracy. Results and protocols in the lab are treated meticulously and done in repetition in order to set up conditions for accuracy however innumerable factors such as the nature of the human hand confirming human error, changes in environmental factors and the constant changing responses of living organisms means that prediction maintains variability, quantification exists within a range of error thus meaning pattern (summarized quantification) must be expressed through a range in order to be represented/explored/interpreted “accurately.” How do we interpret range in this context? I think of it as integrated multiplicity of interpretations. Multiple translations outside of numbers and observational text capitalizing on the 0.01% bias. So let me rephrase: How can considerations of quantification (pattern) be expanded to regularly necessitate interpretations besides numbers and observational text? In order to be “regular and intelligible form or sequence” as described by one definition in Oxford Dictionary, a pattern must undergo multiple forms of translation to be understood. Translation, interpretation and the infinite concept of languages, my friends. I had a great talk with one of the cofounders of the lab around the evolution of interpretation and languages in synthetic biology. Essentially it’s all about the development of “languages” he said (as I have come to understand myself as well). In order to expand rate and quantity of not only synthetic biology lab work, but also any lab or “hand-crafted” work as he said, languages for facilitating this work must be expanded upon. With hand manipulation of a majority of elements in an experiment comes human error, problematic experiments, confusion on what went wrong and decreased rate of results. In order to increase accuracy and efficiency, attempts through standardization have resulted in the recent development of many programmed operating languages developing to be read and carried out by a computer. The day when a protocol can be electronically sent from one computer to another to then be carried out by that computer seems to be approaching. 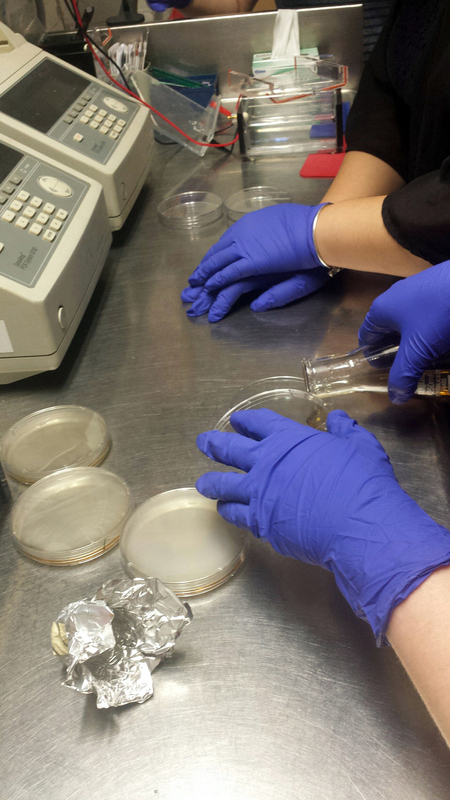 This development of automation points to potential increases in productivity, thus allowing not only for expansion of biotech companies and more engagement in the DIYBio realm due to decreased necessary time investment, but at a fundamental scale- this allows people to spend more time ideating, conceptualizing than carrying out repetitive protocol steps in the lab. I find these developments of programmed languages for synthetic biology exciting however potentially limiting? Will understanding of actions being carried out from a protocol by the computer and the meaning / effect of those actions be hindered by the ease of technology’s commanding role? And how does this type of development affect the public without extensive understanding of science least synthetic biology, their process of learning in the DIYBio, Synthetic Biology communities? Could these communities become perhaps commercialized in unwise ways because the language containing the knowledge about what’s happening to those cells is encrypted in a code that makes executing protocols concerningly easy (touch of a button). With generally ok national public engagement / understanding in the sciences, does this engage or disengage people? I feel the simultaneous development of visual languages is imperative to address educational aspects of the Synthetic Biology community- facilitating understanding while efficiency is increased. While at Genspace, I’ve come to recognize difficulties it and other community bio-labs face as nonprofits- similar to familiar challenges for all nonprofits. A wonderful yet potentially difficult aspect of a space in which everyone interested in taking a class and becoming involved in the community is welcome, is that unsurprisingly multitudes of collaborations, projects and ideas come out of this space each year. However, as is such with “personal projects,”and funding challenges at times, the completion and documentation of ideas/projects sometimes lacks. 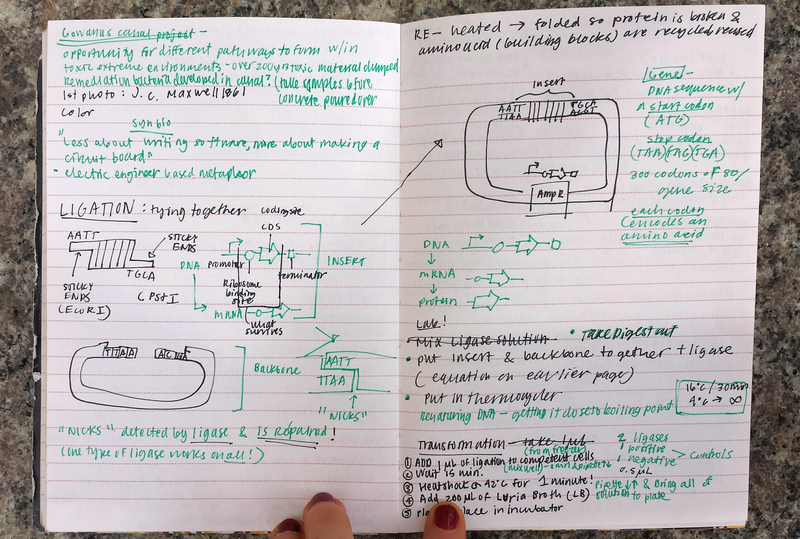 A really exciting project started by Genspace’s 2014 iGEM team is Open Lab Blueprint, a site for aiding the creation of community bio-labs, including a proposal for a lab protocol platform. While started, it was never completed due momentum slowing after the competition deadline. I’m excited to be talking with a designer next week about the platform called “Bioglyphics” and plans for its future development. This week’s title “That which I cannot build, I cannot understand” was heard in the lab and is a take off of Nobel Prize winning physicist Richard Feynman’s quote: “What I cannot create, I cannot understand.”More insight on this quote to come in the next post. 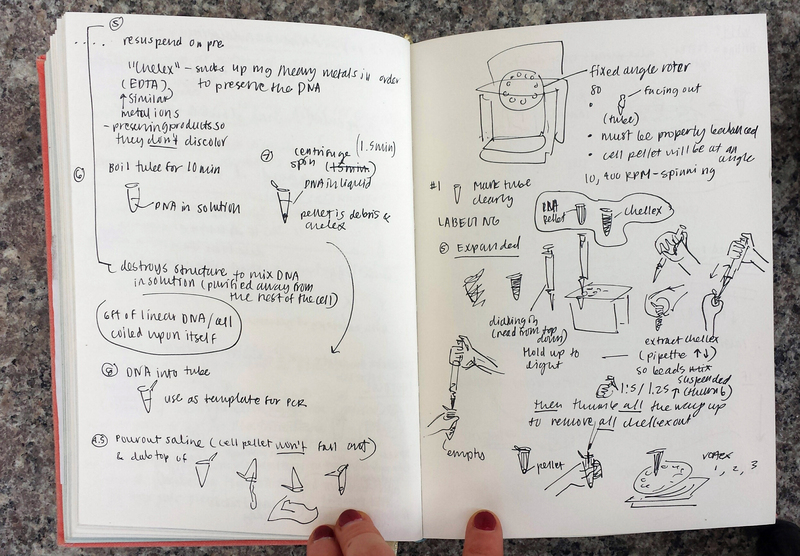 Continue protocol drawings and equipment use standards to make a booklet for beginners in community biolab classes such as the beginner biotech class at Genspace. 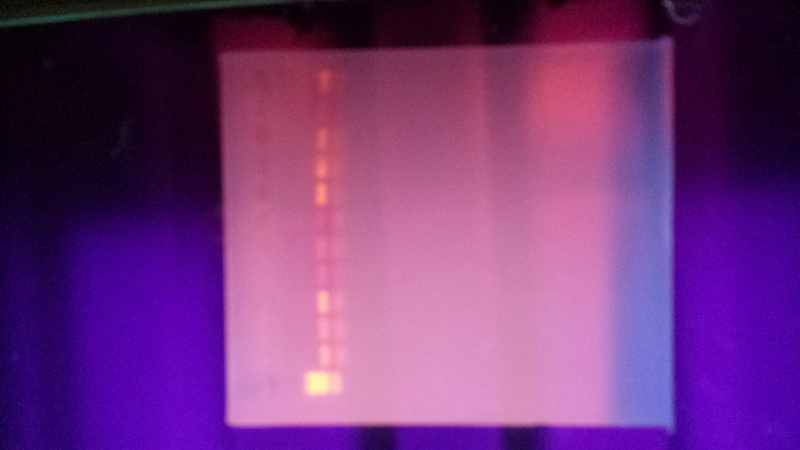 Write interpretations of lab protocols- free verse poetry. Consider questions, prompts, topics to be considered as alternate methods of interpretation and integrate them in booklet. For this post, I’d like to reflect on how heavily this experience has been marked by the theme of technology. Seattle is tech. I pass by both an Apple and a Microsoft store on my way to shop for groceries. All of my college acquaintances who I’ve reconnected with are attached to the biggest names in tech. New people I meet ask me who I’m interning for this summer, Microsoft or Amazon. And hit recently by the phenomenon that is Pokemon Go, the city feels especially strange to me as my commute to work—a 20 minute walk uphill to the University District—is marked by passing by crowds of students whose faces are determinedly glued to their iPhone screens. The basement under the United Christian Church, where Books to Prisoners, is, however, a place frozen in time. Or is rather a place that eschews the concept of time altogether. Whatever happens above ground—another sports event, another shooting, a new Pokemon stop—in Books to Prisoners, the rhythm is the same. Michelle greets you when you walk in; sometimes Birch or Catherine at the packing station, ripping tape from the rolls and checking addresses. You sign in your name on a sheet attached to a clipboard and make your way through the boxes to the long tables, where a stacked row of letters wait. There aren’t any screens in the basement, save for the one on the Dell laptop that Michelle and the other staff members use to mark returns. If it’s a Thursday, the community jazz band is rehearsing in the auditorium next door. Dave from the Food Bank down the hall also would make an appearance to give us cupcakes and boxes of chocolate that they couldn’t distribute at the Food Bank, but they moved to their shiny, new location three blocks away in mid-June, so we don’t see Dave anymore. If you are a first time volunteer, Michelle gives you an orientation at 6:30. You sit down on the long table together and Michelle walks you through why BTP exists—how there are 2.3 million people incarcerated in the United States in facilities that don’t provide quality rehabilitation programs, that don’t maintain good recreational facilities, that can barely keep a library open longer than once a week. How programs like Books to Prisoners exist because prisoners want to build vocational skills, study for GED exams, and/or simply be able to give themselves something to occupy their minds with during the day, and the state of many facilities are such that they are unable to do so through the institution. The volunteer then fills out an invoice and mailing label, copying the address found on the letter by hand. He/she ties a rubber band around the package and then adds it to the pile of books that are then packaged by staff, who wrap them and deliver the books to the post office on Wednesdays. “You guys should host gift-wrapping parties here,” I remember saying once. “I mean, this already is gift-wrapping party,” Birch responded with a smile. Birch is a staff member who had been with Books to Prisoners for a year and a half. He comes down least 10 hours a week to a space is open only 16 hours a week. He does not get paid for his work. I learned that he used to be in tech himself—that he had started a company with a classmate after college and after achieving a fair amount of success, realized that he was not happy. He quit his job and dedicated his time to volunteering full-time at various organizations. He is vegan and lives in a co-op. I don’t mean to romanticize, but there’s something so striking about the way in his journey to find meaningful work—packing books in basements, lugging boxes in food banks—happen in the heart of tech, where so many of my undergraduate (and graduate) colleagues envision themselves finding success. And while the process of book packing is an admittedly slow one—the current backlog of letters date to May of this year—the process to me represents more than its service given to prisoners in need of reading material. The experience of volunteering at Books to Prisoners is also the experience of making out handwritten messages on lined paper, of running one’s fingers past book titles in the stacks, of writing addresses by hand in pen and taking in the names of streets and drives in states that they will remember because they didn’t copy-paste it with a button. To me, the experience represents a call for contact and for greater connection. This is what Books to Prisoners has taught me thus far. Afer a week of curing in the water, the first batch of the roof tiles was ready for testing. First, we checked the surface. We got rid of those with holes and cracks on the surfaces. These holes were caused by the improper handling during the vibration process. These products were not good for roofing. We brought the smooth and intact one to the further tests. We weighted each product and compared each weight to the weight of the common clay tile. A common clay tile is around 2.75 kg. Since out tile is 30% larger than the clay one. We need to control our tile under 3.6 kg in order to beat the clay tile. The picture below is the one with rice husk ash in the cement mixture. It greatly reduced the weight of the tile to 3.25 kg, which is 10% lighter than the clay tile with the same size as our tile. For testing the ultimate tensile strength, we loaded 10 kg sand each time into a bag on the top of the testing machine. Most of the tiles we tested can withstand 80kg, which was over the strength requirement (60kg) for local housing roof tile. The tile broke when the load surpassed its ultimate tensile strength. We examined the cracks and broken pieces carefully to study their properties. One of the benefits of having fiber reinforcement in the tile is that the fiber material binds the tile together when cracks appear. Some tiles broke easily, and we found that it was contaminated by other materials during the mixing process. For the brick, we also made some progress in the past a few weeks. Even we have not yet tested those bricks, which require a long curing time (one month). The bricks looked very neat and felt very sturdy in hands. I have confidence that the coming strength tests will have some pleasing outcomes. In the meantime, I also thought about how to improve the brick wall construction. I want the brick wall to be clean and neat without exposing any mortar. I also want to minimize the use of mortar in the joints to bring down the cost. So I looked into the design of interlocking brick. The mould of the machine determines the shape of the bricks. By altering the mould, we could get a variety of shapes according to our needs. In STVTC, I found another compressed brick machine that loses its mould. I decided to design a new mould for it. I designed a mould that could make bricks with dovetail joint on the short sides so that no mortar is needed to join the bricks in the horizontal direction. The bottom of the brick has a channel to fit the upper extruding parts. Only minimal amount of mortar is needed to fill the gap between the extrusions and the channel. It also saves the masons a lot of time in leveling and aligning the bricks. The wall would look absolutely clean and straight with this kind of brick construction. In order to minimize the production cost, we visited the local junkyard shop to search for used materials that we need for the mould. We got a few 10mm and 12mm used industry steel plates. However, we encountered an issue. The manufacture of the mould required the work of milling machine and lathe machine, which supposed to be provided by machinery workshop at STVTC. But because of some financial problems, STVTC closed down their machinery section a few years ago. We had to find another way. Finally, we decided to cooperate with the students and teachers from the Eastern Technical Institute (ETI), which is another vocational training center in the local district. A lot of the faculty at STVTC received their training from ETI. ETI has larger machinery workshop and better facilities. Oxy-fuel cutting to cut the steel plate in approximate sizes. Milling machine for cutting exact and complicated shapes. One bottom Plate of the mould in progress. It will take about ten days to finish the mould. I will update the result when we finish. Although the mould could be done easily and accurately with modern CNC machine and laser cutter in the capital city Colombo, I decided to do it locally with the less developed tools and machines. Such decision was made based on the core idea of my research, which is to work with the limitations of the local resources. Also by giving such task to the local people, it would help them gaining more experience, which could be helpful in producing other modifications in the future. Change is the only constant in the life of service members and their families. Major moves (often transcontinental) occur anywhere from yearly intervals up to four years. The span between moves is often interrupted by multiple deployments which range from training missions, to humanitarian aid, to combat. A friend of mine, who is a former pilot in the Air Force, averaged 310 days worth of deployments in the calendar year – and that was during peace time. From the transient environment, come sarcastic colloquialisms, such as: “Home is where the military sends me,” or “Home is where I store my stuff.” One learns to not ask a military kid, “Where are you from?” unless one wishes for a look of confusion and/or disdain. A former student of mine had moved 14 times before her 13th birthday. The military is known for being regimented. When I ask marines what they do at work, training nearly always comes up in their answer. The Marine Corps ensures that each of its members knows their job backwards and forwards. It makes sense that, in the chaos of battle – or even in the transient lifestyle – one needs to know their job by rote. The means to this end is simplification and efficiency – even at the expense of the simplest, most efficient solution. Job descriptions and policies are often written by what seems to be a good solution at the time. The training criteria is then disseminated and leaves little room for questioning or interpretation. Another oft uttered colloquialism is that “if the military wanted your opinion, it would have issued you one.” So, while one’s job differs greatly from location to location, and times change quickly, the slow grind of the bureaucratic structure and the unflinching culture of tradition, duty, and authority severely limit the potential for more efficient solutions. One of the reasons that I chose to work with marines for this project is because of the general lack of creativity within Marine Corps culture. In the last two weeks of classes, this point was highlighted as we learned about brainstorming and ideation. The creative dichotomy between the high school class and the marine class is palpable. It has taken much longer for the marines to warm up to creative ideation, even though they are only one or two years older than the high school students. I feel that the heart of the matter is one of permission. In many ways, the straight forward direction and rote training of the military makes sense. In certain situations, repetition and muscle memory will save your life. It is difficult for young marines to feel the freedom to think outside of this context, even when not at work. It has even been a challenge for my marine participants to call me “Chris,” rather than “sir.” We are getting there, slowly. Hydroelectric generators, coolers/seats, hoods to keep your feet dry, sonar, PET bottle construction material, so many creative ideas!! The fluctuation of personnel constantly transitioning in and out still has its effects on policy, despite the attempts at standardization. On my way out here, my supervisor had secured a building on the Marine Corps base for a classroom studio space. By the time I flew out, the commander who had approved the space transitioned out, and his replacement decided that there were other priorities that demanded the use of that site. My supervisor quickly worked to find a workshop off base. Being off base makes it more difficult for young marines to make it to class, as they are not allowed to drive. At the same time, however, this turn of events created a greater opportunity to recruit local Okinawans to participate in the design project with us. What better way to learn about empathy than by working with people from other cultures? Unfortunately, the language barrier has proven greater than my hopes, so far. Translators are difficult to come by, as are English speaking Okinawans. With four weeks left, I’m still hopeful that those connections will happen. My Maharam Fellowship experience in Okinawa is challenging, as I face systemic and cultural barriers. But a good challenge provides good opportunities to design solutions to meet those challenges. The shape and tempo of classes change (sometimes weekly) to meet the needs of participants. And with each class, we have had great moments of synapses connecting and lightbulbs turning on over our heads. In one such moment, one of the marine participants returned to class after a research/survey assignment. The assignment was to survey as broad of a population as he could, in order to gather information about potential “customers” in the base population. It was clear that his samples all came from his peers. When I probed as to why he didn’t survey others around him, he informed me that the other people around him are sergeants, and he doesn’t like sergeants. 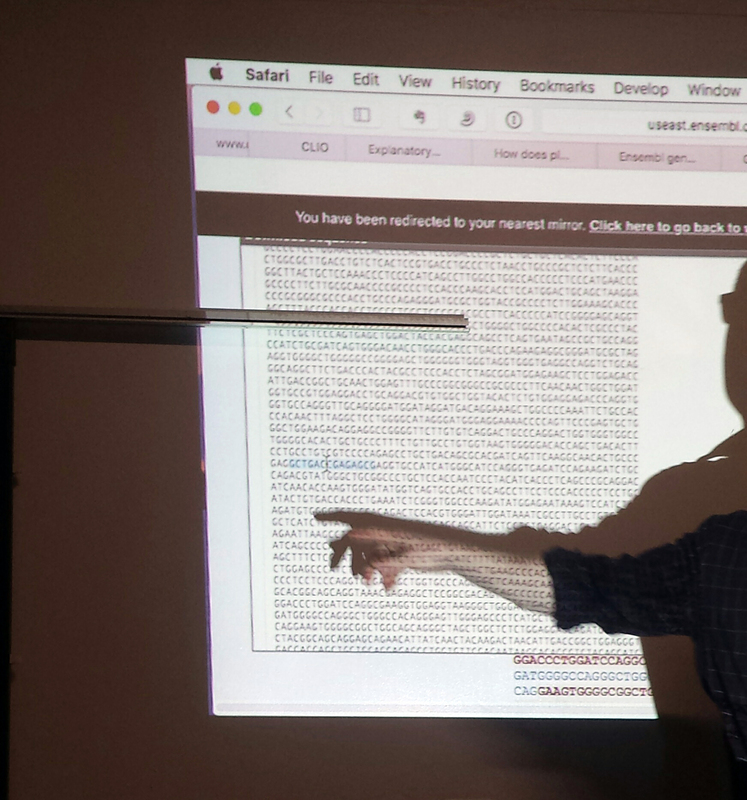 The conversation turned back to the data he collected. It was apparent that his peer group is unable to purchase a paddle board from our mock-business at a price that is sustainable. The logical follow-on question was to ask who, then, is a better customer target? He concluded that sergeants earn a considerably higher salary and would likely be a good target. He quickly realized why it might be beneficial to empathize with sergeants though he might not sympathize with them. One of the young marines joined with the high school class to help shape prototypes. The conversation then took a turn toward the importance of empathy in leadership. The marine admitted that he didn’t like sergeants because they doll out extra work and discipline arbitrarily. Sergeants, in his mind, don’t deal fairly with subordinates because they don’t know them. So, perhaps, a lack of empathy leads to poor leadership. Pressing on, we discussed that in may also be that the views of the subordinate marines are also skewed because they don’t understand the experiences of their superiors. The eureka moment, however, hit when he realized that, if all goes well with his career, in a couple of years, he will be one of those sergeants. This thought had never been within his grasp in his short tenure. Together, we concluded that empathy is a very important part of leadership, and a dose of humility to recognize that we aren’t superior to other peoples is a great first step to being a good leader. The past couple of weeks have been perplexing, and even frustrating, at times. The Marine Corps culture and the circumstances here on Okinawa don’t make promoting creativity any easier. In the midst of it all, however, there are still great moments with the marines and the high school students that I feel utterly privileged to be able to work with. Since my last post, I was able to interview many more patients and clinicians. I have contacted 9 therapists and prescribers (clinician who assigns medication) on the outpatient floor so when and if appropriate I can interview any of their patients for a few minutes. So far, I have interviewed 28 patients and with more to come with ages ranging from 6-20. Jason and I spoke how though the game would be primarily directed towards 6-12 year olds, getting insight from older teen patients would be vital. In a way, I think that teenagers would have a better understanding of what they need over what they want out of therapy, particularly if they have been going through it since childhood. Having spoken with a few, they talk very much like veterans and they have so much dignity and awareness of their situations. They’re honesty and sincerity has been great to see and the energy and curiosity of the younger children has been amazing to experience. For a little bit, I would use a notebook and pen to write notes. But then I realized, “Hey, I’m not a therapist and I’m from RISD so what am I doing?” It didn’t feel natural. So instead I started using drawing/note taking on a large sheet of paper so that kids can see what I’m writing. This proved to be so much more effective, especially kids with low focus or low verbal skills, this stimulated our conversations to a great level each time. They sometimes draw with me, too! Got really into this one. We had to extend to a couple more sheets. Just to share some clinical insight form these past couple of weeks, I spoke with the Assistant Director of the Center for Effective Child Therapy from the Judge Baker’s Children’s Center, a center dedicated to improving children’s lives by empowering their emotional, intellectual, and developmental well-being. The Assistant Director, Dan Cheron, Ph.D and I had a conversation about his methods and practices as well as his thoughts about our biofeedback game. He related how he always introduces himself to a new child first before the parent. “It’s very important to get down to their level, and ask them if they know about the center and what it’s about. Sometimes, parents don’t fully explain why kids are brought to places like ours.” I appreciated the thoughtful considerations he has towards communicating with children, especially what he said about keeping conversations on a first name basis, so kids can call him “Dan” instead of Dr. Cheron. “It keeps our conversations more casual,” he explained. He also shared how he would keep language developmentally appropriate, a method which ended up coming in handy during my patient interviews, particularly if someone is very young or has certain cognitive disabilities. But on that note, the older kids seem to appreciate my interviews more when I don’t beat around the bush and I flat out say that this is a “therapy” game we’re making, particularly for kids who need to learn how to stay calm and focused. I have to asses each situation separately and be careful about language and wording each time. Going back to Dr. Cheron, for the encouraged that we should include a tool box of skills that a child can refer at crucial times. He also said that, as much as possible, we should make opportunities for children to feel like an expert. He said this would increase parent/guardian/caregiver engagement and the experience would become more collaborative. To an extent, this gives children a sense of control and agency of their experience. Miranda’s job is essentially to lead and organize music therapists, artists in residence, and a multi-media studio in the hospital called Seacrest Studios (created in partnership with the Ryan Seacrest Foundation). Music therapists are fully trained staff in a clinical setting who use either singing and/or instrumentation to help children heal. Artists in Restidence are not fully trained in therapy but instead come from either educational and/or professional backgrounds in fine arts or design practices. They share their creative skill-set to children through writing, illustration, printmaking, digital media, etc. and in turn, patients can experience these creative projects and even continue to apply them when they leave the hospital. Before our conversation ended, Miranda said that she could connect me to the Inpatient Psychiatry Unit in the Hospital since Jason and I only had luck interviewing from the Outpatient Clinic. To expand our audience, Miranda said that reaching out to her or her other colleagues about the inpatient unit would be a great asset to our research. “They’re a very creative bunch over there.” She related how much the patients valued having the arts program visit them since it keeps them stimulated and excited about their projects. This past week, I went to inpatient twice with the expressive arts therapist group. I have to say the reason this experience was very meaningful but moreso relieving, and it may have been relieving for reasons different from what other people would feel. For personal reasons, I’d like to save some exposition until after the internship ends because I can better collect my thoughts and I’d like to reflect on the experience as a whole in that way. But what I can share right now is that having the opportunity to visit the inpatient unit was initially both very exciting (because seeing new patients is always exciting) but also very worrisome. In a way, I knew what I was going to see but I also had no clue what I would actually experience, especially emotionally. If you can ignore the ambiguity of that description for now, I’ll sum up my experience at the present as, yes, “relieving.” And I say this because a lot of my preconceptions were wonderfully proven false. I expected to see lifeless, bare walls and ceilings but I saw colorful paintings and carpeted floors. I expected to see barred windows but they were large and hopeful with sunlight streaming through. I expected the space to feel like a cold tight space, like a prison, but there was a communal kitchen, a beautiful art room with a stereo and a Shrinky Dink, handwritten nameplates for patients’ rooms, and a decent amount of space to walk around. And the best part of all was seeing the patients. Of course, not all the patients wanted to speak with me, but the ones I got to speak with were really great. Some were reluctant at first, like this one 11 year old boy, but the open-note taking/doodling method had them open up to me a lot more. I wasn’t trying to jip them of anything: I really wanted to hear their thoughts and really find meaning in their words and faces. With just a few weeks left (ack!) to interview patients and create design/illustrations based off this research, I’m in early stages to develop a character. I’m seeing the current iterations as plans rather than drawings, thinking through what elements of each kids respond to the most and then continuing to reiterate as frequently as possible. I’m thinking through the subtleties, such as body language and how the character introduces themselves. “Coach” character thoughts. Expressive, outgoing, but can still be serious and calm, especially when sharing coping skills. Can be a little older though. Also thinking through having two characters (a coach and a friend) to see them interact with each other. Concept sketch for outer game world-journey, creative places to explore. Before signing off on this post, I wanted to reflect on this project on the perspective of the audience that Neuromotion is addressing. Of course, this game will initially target younger kids, particularly ones with emotional regulation issues often associated with anxiety and ADHD, but the audience we need to also reach are the parents of these struggling children. I’ve been making my own sort of assumptions about how these parents must feel having gone through so many therapeutic and medication options to help their child, and I could only imagine how tired these people must be. But one of the clinicians who I approached about interviewing their patients thought that before I interviewed someone, I should sit-in on their prescriber meeting. I mentioned this aside in the beginning of this long post, but basically unlike therapists, prescribers help decide what medication would suit a client, in this case, a little boy. We were all in one office: the prescriber, the two parents, the child, me, and I think another clinician or intern who sat in the corner. I first met the parents and their child (let’s call him Mikey) in the hallway with the prescriber, and we both explained what my project was about and how I’d really like to interview their son. They were a really nice couple and Mikey was a little shy, but I liked them a lot. There were just a normal family. But then when we were all in the office, the prescriber began to discuss more official business about the son’s prescription amount, how many milligrams they increased and if they need to add more milligrams or try out a new medication. The Zoloft wasn’t working, the mother shared with a deep sigh, saying that his son had repeated outbursts and was taken out of school twice. The prescriber then proceeded to make other suggestions and look back at Mikey’s medication history on his computer. All the while, Mikey was sitting in between his parents, fidgety and anxious. He only focused when he pulled out his 3DS and played, seemingly blocking out what his parents and the prescriber were discussing over his baseball-capped head. At one point though, when the prescriber suggested a new medication to the mother, Mikey, without looking up from his game, demanded, “What’s that? What’s that?” He repeated it over and over. After a little bit, he looked up to his father and asked, “What’s that? Is it going to taste bad?” His father shook his head and tried to calm him down, but Mikey then turned to his mother: “Is it going to taste bad? Is is going to taste bad, mom?” Intently listening to the prescriber, the mother didn’t respond so Mikey dropped his face to his game, defeated. I was overwhelmed, but I did my best to sit there and contemplate whether I should nod sometimes or just mostly look at the prescriber. A few times, I’d make eye contact with the mother, seeing her worried even desperate exhaustion. I found myself nodding reassuringly, but I have no idea why. I wasn’t qualified to reassure anything, but I didn’t know what to do. I’ve never heard so many medication names within a span of 15 minutes. Aside from Mikey questioning the new medication, what affected me the most was a little green notebook that the mother wrote in during the meeting. As the prescriber listed different medications and their milligrams, she wrote down all his words. I kept looking at that notebook, and I had several thoughts then and after. I wonder if she bought that notebook specifically to write down Mikey’s medications. I wonder how she feels pulling the notebook out of her purse each time at these meetings or when she’s picking up medication at a local CVS. I wonder if she hates that notebook, that she’s imaging the day that she doesn’t have to take it out of her purse anymore. Afterwards, Mikey and I were able to go to the waiting area and I think it was a relief to both of us that we could just talk about games and characters. What I gleamed from Mikey’s interview as well as from all the other interviews so far is that these children, these teens, these people want to have a sense of choice and strength. This want freedom to explore, to discover, to have fun especially considering their situations where they very little choice in deciding their therapist, their prescriber, their medication. They want to see themselves in the game, they want to be Luke Skywalker or Batman or Superman or a fairy or a princess in a pink dress…and they want to defeat the forces that scare them the most. There’s a lot of promises I feel like I’m making with this game. Some higher forces might come into play unfortunately, like budget, time, budget, staffing, budget… a start-up can only accomplish so much. But at least for now, I’d like to put that away from me. I’m not about thinking about financial practicalities because that’s only going to hinder any progress. And it’s not fair to the kids if I just write off everything they shared with me so far. So my goal is to get as much done as possible and to record everything I find. The ultimate goal is to increase patient motivation and see what these kids want as well as what they need from this game, and I have to say I think I have a very strong idea of what that should be. After my previous field trips to the local villages and workshops, I found a lot of issues about the local housing materials and construction techniques. One particular issue that drew my attention was the local fired-brick. Traditional fired bricks have a lot of drawbacks. They are weak and dingy, and the firing process causes air pollution as well. It is a technique that is banned in a lot of other countries. But due to its low cost, it is still the most common material for the housing construction here. However, due to the low precision and unevenness of the fired bricks, masons have to add an excessive amount of mortar (a mixture of cement and sand) to level them up and bind them together. The outcome is that the walls usually look crude and crappy with the excessive mortar outside, so the villagers have to apply another layer of plaster (also contains cement) to give the wall a finishing looking. However, plaster not only costs a lot but also seals the bricks so that the walls don’t breathe. Living in a plastered house feels hotter compared to a unplastered one. Another issue I found was the trend of using concrete blocks in the local housing projects. People want a concrete building because it is more durable, and it feels “western” and “modern-looking” to them. However, most of the local houses are only one-story height. There is no need for such strength. Besides, cement is imported and very costly. It does not work quite well with the climate and culture here unless we alter it with other local materials. The importance of creating a housing scheme that is cost efficient and culturally and environmentally suitable is very urgent. In St.John’s vocational training center, I found three compressed earth block machines in the storage room. Because of the poor maintenance, all the machines were broken down and they were left in the storage for many years. Compressed earth block (CEB) has a lot of advantages compare to the fired bricks. CEB is strong and neat, and there is no need for fire curing. The main ingredient for CEB is soil, which is locally available and it is also biodegradable. By adding stabilizer into the soil, CEB can also be water-proof. In this case, no plaster is needed after finishing. So I decided to fix one of the machines to start my experiments with CEB. I asked the automobile students and teacher to gather parts from different machines to reassemble a workable one. Now the machine is back to work! My goal for the following experiments is to test the strength and other potentials of the CEB by adding different natural resources as fibers, aggregates, and stabilizers into the soil in order to decrease the cement stabilizer and bring down the cost. Coir fiber is a natural fiber extracted from the husk of the coconut. It is a cheap and common material in local for bedding mattress, sitting pads, ropes, and other handicrafts. Students and I decided to add it into the soil. The first one we made was a failure because we added too much water. But we will cure it anyway to test the strength. the stems of palmyra palm have very rich fibers that are extremely strong. I want to extract them and add into the soil. And then we placed the fibers under the sun for one day until they totally dry. Beautiful and neat bricks with fiber texture. The students were surprised at the outcomes. Even though they were very familiar with the palmyra palm, they never thought about using it in the construction materials. Cow dung is one of the most commonly found wastes in the local villages. Villagers use it as fertilizer for their farms. From my previous field trip, I was surprised at its use for natural plaster on the mud house to get a polishing looking and also repel the insects. Cow dung is very hard when it is dry, but when you break it down, you can find all the fine fibers that are not yet digested by the cow. Cow dung is a natural “clay” and the fibers inside can reinforce its strength. The villagers today are against the use of this material in their houses because it is a humble material, and the families that use this material are poor and backward to them. I think my purpose is to teach the students to never underestimate any materials that just look humble because design can transform materials for a better value. Afterall, can you tell if these nice-looking bricks were made out of cow dung if I did not tell you? Different soils have different qualities and characters due to the percentage of gravels, sands, silt and clay they contain. Gravels and sands enhance the strength of the bricks but they have very low cohesion. Clay does not have strength but it is a natural binder to bind all the particles in the soil. In order to make a durable compressed earth block, we need to be very careful about the selection of the soils. Choosing the right soil is significance to the quality of the bricks. Too sandy or too clayey soils may cause weak and cracked bricks. We experimented a lot with different kinds of soils, and also leaned from so many mistakes and failure. Soils also have varying colors due to the minerals they contain. The locally-made compressed earth blocks also can reflect the local geographic context. The simple way of testing the percentages of gravel, sand, silt and clay in the soil is to precipitate the soil in water. The heavy gravels and sand would fall to the bottom of the jar. Silt and clay would sit on the top. Once we know the components of the soil, we could alter its components by adding more sand or gravels for our own purposes. Only with the right kinds of soils, we could make the strong and neat blocks. In the meantime, I also started the tile experiments with the students last week. Tile is a big cost in the housing construction in the local community. One clay tile costs Rs 32 (around $0.25), which is about four times the cost of a fired brick. The clay tile is made by the high-precision machine, therefore,it is not friendly to the villagers with lower skills. In the VTC’s storage room, I also found a broken vibration table for making micro cement tile, which was larger, cheaper and much stronger than the common clay tile. It also requires very low technology. However, the disadvantages are the weight and the heat. So my goal is to reduce the amount of cement in the tile to bring down both the strength (we don’t need that much in tile) and the cost. Students and teacher from automobile section helped me to fix the vibration table. Burned rice husk ash is a waste product that is produced by the fired-brick workshop. I collected some samples from my previous field trip. Because I found this material has surprisingly fine texture and light weight. I tried to add it into the tiles to see how much weight it could reduce without dramatically decrease the strength. I found a lot of wasted wood dust in the carpenter section at VTC. Wood dust has relatively larger texture but it also very light. So I decided to give it a try as well. The bricks and the tiles are still in the process of curing. I will update the strength test in the coming weeks. For the next month, my plan is to continue the experiments and also working on the housing scheme for the low-income family house. Plainly, what is research? and what does it look like for a visual learner, thinker? What is the most effective and needed method, interpretation, translation I can provide in a community bio-lab? Thinking, sketching, proposing, and the key element; starting over has occupied a majority of my time these past few weeks. The message and purpose of Genspace and most community bio-labs is to teach lab techniques and concepts surrounding the creation and evolution of the biotech movement to the public. In a past survey, a majority of Genspace class attendees would prefer taking a hands on class versus exclusively lecture + discussion. “Hands-on” or kinesthetic learning represents the body acting out motions, eye-hand coordination and not only physically, but also visually understanding processes. How do class attendees absorb this information? What are the key details to include in effective visuals outlining a lab protocol? What metaphors seem to expound and explain processes? What questions are class attendees asking? This example project utilizing genetic engineering was brought up and briefly discussed in one of the classes. The response from class attendees was engagement of curiosity in a scaled out form. While it seems a majority of questions during classes revolve around specific techniques, ethics of all different types of GMO’s, CRISPR and press, this involvement of art, philosophical questioning seemed a key interpretive element for these larger topics considering genetic engineering. Can art facilitate removed, wide- perspective processing of technology and ethics? Is science able to quantify art is some form? 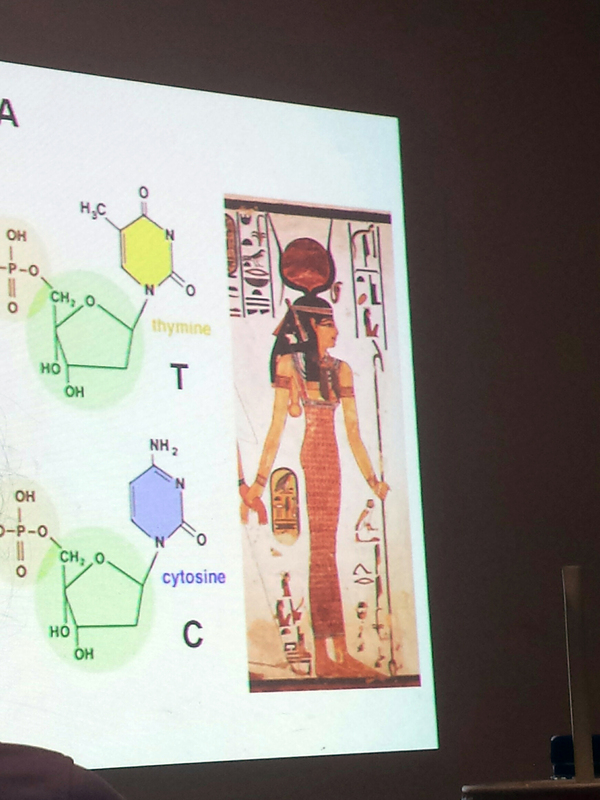 Including more examples of the effect of genetic engineering techniques such as transformation through plasmids by talking about art/design related genetic engineering work in order to facilitate better understanding of the effect and possibilities of what class attendees are learning on a basic scale. Art perhaps serves as a neutral ground between the realms of research and product. Including teaching tools that physically represent the idea of biology as building blocks. Utilizing more hands-on tools to fill in steps of kinesthetic learning; content that is: 1. orally presented 2. written 3. drawn out 4. absorbed through visual diagrams (a key aspect I’m working on) 5. enacted with hands-on “building blocks” 6. procedure executed in lab and then repeated in opposite order to ensure understanding of the role of all reagents and organisms. A “Question” page on the Genspace website and social media pages that stores questions to be answered on community nights such as the PCR + Pizza night. Questions could revolve around misconceptions of synthetic biology in the media, genetic modification processes, etc. After questions are answered on those community nights, icons on the “Question” page when clicked could expand with a thorough answer. This suggestion came out of the observation that people come to the lab however what do these class attendees leave with besides a series of written processes, protocols and written results in terms of learning take-aways? How can people continue to be involved with Genspace after leaving the space? and how can questions be more efficiently addressed and engage people outside of the direct lab space in a way that would encourage them to come to Genspace? Artists/Designers/Public interpreting simple lab procedures such as DNA extraction to be featured with open source written protocols on sites such as “Open Lab Blueprint.” http://2014.igem.org/Team:Genspace/Project/Open-Lab-Blueprint The course of the workshop could be slower paced and more question based in order to facilitate sketching or additional note taking for interpretative making. Essentially, this workshop could facilitate an amassing of visual and written open source lab protocol content in a variety of interpretations in order to accommodate varying learning styles. Workshop revolving around creative writing and designing or interpreting lab protocols and procedures, perhaps “Storytelling of Lab Protocols through Poetry; how lab procedures and experiment results manifest in a literary form.” Evelyn Reilly, an ecopoet writes free verse poetry revolving around material and chemical compositions of man made materials such as Styrofoam in a form reminiscent of lab procedures. Poetry and lab protocols could be compared / contrasted and then merged in a literary form. 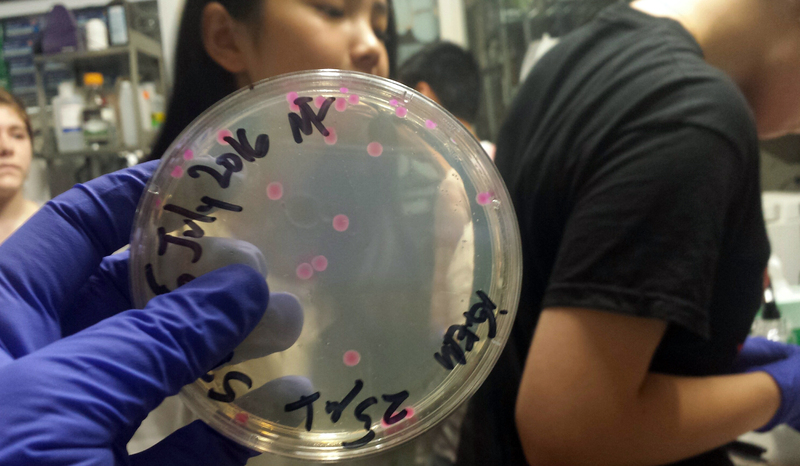 As I have continued to observe progress and lab protocols/ methods used by the Genspace iGEM Competition group, introductory biotech classes each week and interact with new-comers to Genspace during a “PCR + Pizza” community night and Kombucha and Ginger Bugs Fermentation Workshop (exciting research on the health benefits of fermentation for a range of health conditions, one of which is autismhttp://www.contrabandferments.com/– check out “Missing Microbes” by Martin Blaser http://www.nytimes.com/2014/04/29/health/missing-microbes-how-antibiotics-can-do-harm.html and a crowd-sourced, citizen science based project on mapping the human gut http://americangut.org/) I’ve focused my work on sketched visual interpretations of lab protocols to be used in classes and ideas around making this a more accessible space– the latter I believe is closely linked to visual communication and aesthetic of branding and communication to the public. What learning techniques / answers are not being communicated well? What isn’t being talked about in relation to Genetic Engineering? Thanks y’all- stay tuned for more thoughts on under utilized forms of visual interpretation and considerations of the “wisdom of the crowd” in relation to current events. As I sit at my desk, this somewhat goofy looking (but nevertheless very serious) PR2 peers over my shoulder. Just within arms reach, it seems enough like a sentinel that my joke before leaving about robots censoring my blog posts seems all too prescient. Yet I couldn’t have anticipated what it would be like to make art in such an environment. There is at least one familiar element: much like at RISD, you can feel how hard people here work. In the myriad projects one has to weave through when walking around the lab — whether the focus is experimental, “industry projects,” or somewhere in between — there is clear evidence of people throwing themselves headfirst into deeply technical waters. The language of the lab is ROS (Robot Operating System, pronounced like the name “Ross”), which is hosted for the world on site. ROS is as close as one comes to a lingua franca in the robotics world. Typically ROS is used for interweaving complex networks of data and motion, used for instance by NASA for controlling the Robonaut aboard the ISS. In my first two weeks here I’ve taken on multiple roles: that of anthropologist, lab participant, and artist. I’ve been taking in and interacting with the culture of the lab, and trying to better understand how roboticists conceptualize the work they do (for that approach I look to Bruno Latour, whose book Laboratory Life provided the title of this post). I’ve also been trying to develop my own technical understanding of the work that’s being done so that my work will be commensurable with the dialogue of the lab. And in continuing my own artistic practice I hope to contribute to that dialogue. While the form this will take is still uncertain, the relevance of these considerations in our culture have never been more apparent. Since getting here, there occurred the first fatal crash of a self-driving car. Last week police used a robot to deliver the bomb that killed the gunman in the Dallas shootings. In the aftermath, it’s all too clear that the nature of our connection to technology deserves to be seriously and critically addressed — not just from within the field of robotics, but from other perspectives. I had an intense conversation with Michelle the other day. So much of what we’re able to do is dependent on funding. Anyone who’s worked at a non-profit for even a week will be able to tell you that much, at least; I know it’s naïve to think otherwise. But something about being in a school where we are encouraged to think without limits and see where we can go without the weight of officiated standards and constraints makes you forget about all of that. Books to Prisoners is waiting to hear back for funding renewal from a foundation that allowed them to expand their operations in 2015. Its increased hours and ability to pay Michelle $15,000 a year for her commitment to come in four or five times, 15–20 hours a week are all made possible by a grant that it received from a foundation (or it might have been the state…) that distributed money that it won from a lawsuit to non-profits. Michelle told me this one year ago when I told her how impressed I was by their frequent volunteer hours—as compared to the once, twice, maybe even three times a week schedule that other prison book programs maintain, Books to Prisoners holds four four-hour volunteer sessions a week, spread across three days. Michelle is the only paid staff member that I’d come across in my visits to the various programs. Unfortunately, part of the reason why the organization struggles to keep afloat is because it falls in a very specific niche. It’s a Seattle-based program that serves individuals outside of Washington state—it’s too big for state-specific grants, too small for federal grants, and it provides educational services but isn’t exactly a tutoring program. Our neighbors at the food bank, on the other hand, have just relocated to a shiny, brand new space two blocks away from a steady flow of funds from the city that have supported its cause to help Northeast Seattle neighborhoods. I asked Michelle why the different programs across the country didn’t come together to form a national coalition. Thirty different programs across the nation helping the same people and the same prisons—surely, uniting would raise the chances of getting national funding? Michelle argues against it; it’s been talked about before, but the transition would take years and years and perhaps prove to be more trouble than it’s worth. Not only would the organization have to register in all 50 states; it would also have to pay taxes, re-organize and/or re-establish whatever community ties that each prison book program already has to its city/state and go through all the efforts of joining the thirty other organizations—who may or may not want to team up—all for what Michelle considers a “crap shoot” chance at receiving one of the bigger grants. It’s hard. As an outsider, the solution always seems so easy, but I always forget that Books to Prisoners is entirely run by volunteers, mostly unpaid. Staff meetings are held once a month by key holders (and the last meeting in June was cancelled due to scheduling issues.) Change only happens in these monthly-increments, followed through and facilitated mostly by email. And changes that happen with the packages are even slower. A successful package delivery is often one that three weeks to send out; we don’t hear of rejections until months later. I was asked to present at one of these monthly meetings yesterday. I showed everyone the work that I had done in the previous summer, creating a website prototype to house some of the more memorable letters, and creating a photo grid of the different packages that were sent out to prisoners. I also presented a pdf of what I worked on for the past month, which was a reference guide for volunteers to understand the specific procedure on how one volunteers at Books to Prisoners. The design for it was done so that it could be easily printed out black and white on six 8.5 x 11 sheets of paper, double-sided, and stapled. The pages are numbered so that missing sheets can be accounted for. We also carried through with the conversation on the book. I presented a direction for the book that I had been working on for a couple of weeks; after scanning all of the thank-you letters that BTP had received from inmates a year ago, I pulled out key statements from each of the messages and type-set them. I placed the scan of the original letter and envelope in the spread afterwards so that the reader could read the statement in context and also observe the inmates’ handwriting and every detail that comes along with the information. We are hoping to also include some statements and/or essays from prison activists such as Angela Davis, Michelle Alexander and Noam Chomsky. What I hope will come across in these pages, however, is how little difference there is between someone behind bars and someone outside of them. Every time I read a letter that asks for books for vocational training—on learning how to sew, to cook, to write—I think about my friends who talk about their summer plans, who strive to make this summer the summer that they finally learn how to do yoga, or the summer that they start writing again. The other day, I was scanning a letter from an inmate who wanted to use his time effectively by teaching himself how to code and program. It felt heavy, heavier than the others because of all how urgent it felt. I thought about all of my peers who feel the weight of gaining employable skills, of learning how to get a job at Google or Microsoft. It could have easily been written by an acquaintance, a friend, even myself. We are all affected by the same laws of the same institutions. The bars aren’t really there, if you think about it.